Since time immemorial, poetry has moved people’s hearts and shaped humanity at large. As poets we surely have a purpose. Today, in China, speech and belief are under attack. The tyrannical fist of the Chinese Communist Party (CCP) still attempts to crush free society. 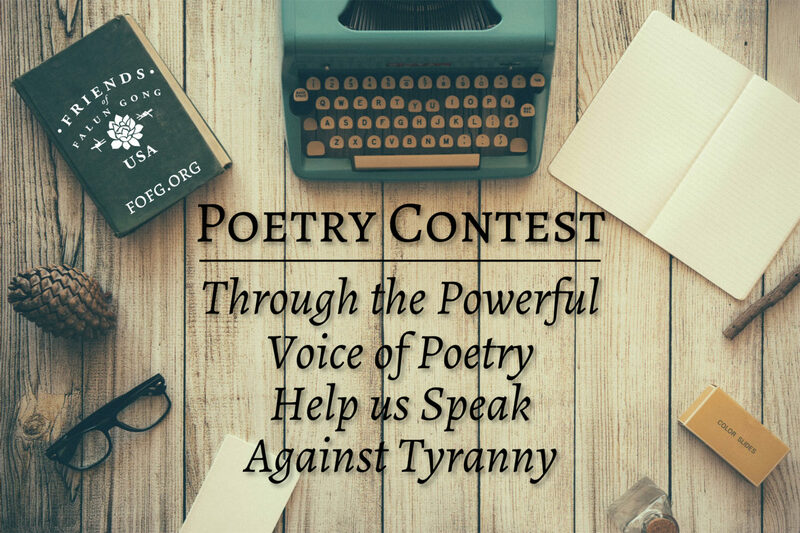 We call on you — poets, peacemakers, fellow human beings — help us speak the truth about the cruel injustices enacted upon good men and women seeking peace and freedom. Traditional poetry with rhyme and meter is recommended but all styles and forms are welcomed. No profanity please. Poems should be submitted as a word file or PDF file to fofgcompetitions@gmail.com by April 30, 2019, midnight EST. Winners will be announced on May 13, 2019 in honor of World Falun Dafa Day. Poems will be judged by a panel chosen by FoFG, which will include Evan Mantyk, President of The Society of Classical Poets. The poet must indicate if he or she is an undergraduate college student, or high school student to be considered for respective awards. There is no Submission Fee.